We are located just off of Rancho Bernardo Road about two blocks west of the 15 freeway, in the first business park on the south side of Rancho Bernardo Rd. Turn onto Via Tazon and we are the first driveway on the west side. If you're looking for information on our brewery, Abnormal Beer, including any sales related questions, please contact our sales team via email. Thank you! Scott comes to us from Delicias in Rancho Santa Fe and Jakes Del Mar. His focus is on taking traditional components and elevating them to create an experience that is familiar, yet very different. Creating beautiful dishes that are relatable, yet elegant. He has a perpetual smile on his face, which translates directly to his food. Great food comes from happy chefs. Ginny began her restaurant career in Chicago but came out to San Diego in 2016. 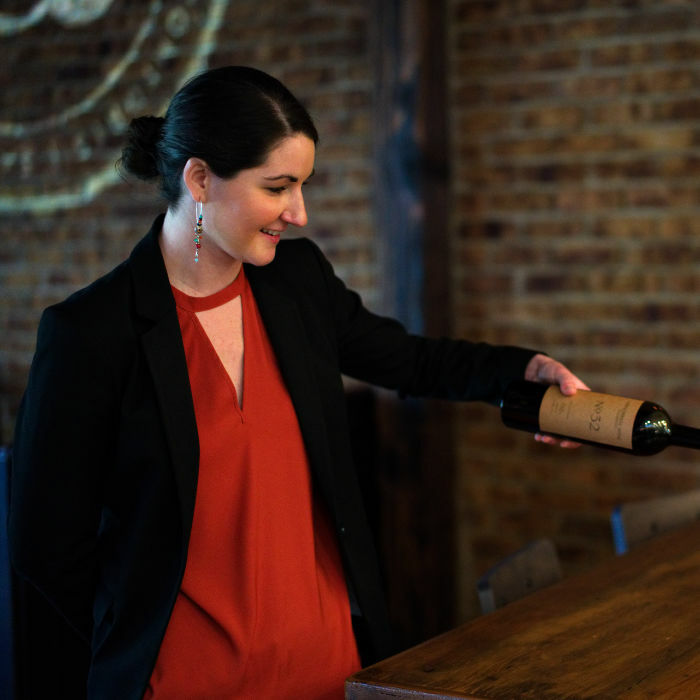 She brings a wealth of knowledge and experience not only with food service, but with wine as she is going for her Advanced Sommelier. Her awesome attitude and fine dining service expectations are elevating our team to achieve a whole new level of awesomeness. Her background in stand up comedy also lends well to keeping smiles on our staffs faces. Becky is our in house event and craft connoisseur. When she's not putting on awesome events for our guests, she's enjoying a cold beer(s). She has over a decade of experience in the service industry and spends a great deal of time educating guests and our staff to keep spreading the knowledge of craft beer. For anyone thinking of hosting an event with us, you'll have the pleasure of working with an exceptionally talented young woman. Cassie is the awesome woman behind the scenes of all things Abnormal guiding our marketing efforts, covering social media and handling all event logistics under the Abnormal umbrella: @abnormalbeerco @thecorkandcraft @abnormalwineco @abnormalkorea. She comes from an events and marketing background in the beer & hospitality industry. Elvin, also known as The Hammer, Mr. Excel, and Spreadsheet Master; is the man that ensures that everyone behaves and doesn't buy $300 plates and golden spoons. He has a long history of managing money as he is the head of his family hotel, The Ocean Park Inn, in Pacific Beach, as well as his hotel software platform HotelBeat. Outside of cracking the proverbial whip, Elvin's favorite thing to do is to crush the dreams of all of the fancy restaurant items that we can't afford. The man behind the curtain, Matt can be found doing pretty much anything from fixing equipment to putting together investor packets. A graduate from SDSU business school, he also has a long history of various business ventures of everything from finance to building material distribution.